“Explain how I can attract and retain better quality clients” was one of the responses from 92% of the people who attended a webinar I presented last year in which I asked the following question: what are the top 3 questions you’d like me to answer in the book I’m writing on practice development? I will address the issue in detail in the book but for now let me share with you an overview of the approach I recommend. 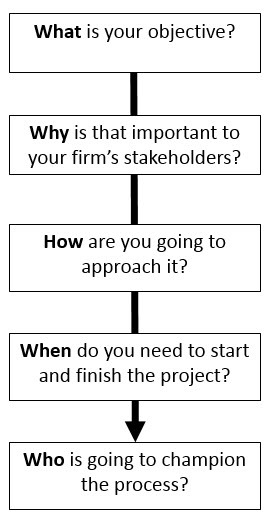 In fact it is a framework for approaching any significant issue in your firm. It’s called the What-Why-How-When-Who framework. Why: This will offer our firm the opportunity for a higher financial return, a greater sense of contribution, a more rewarding professional career for all our team members and owners, and a sustainable competitive advantage in an increasingly brutal market place. I need to get “buy-in” from the key players in my firm. This includes not only my co-owners but also our non-owner team members. This will involve clarification of our vision, mission, and values. I need to be clear about the criteria I will use to define “better client” because unless I know what a “better client” looks like I will not be able to design and deliver a service offering that represents value to that cohort of clients and value to our firm. I need to develop a marketing and sales plan to attract clients who meet my criteria. This plan will be built on the support we have from existing clients who fit our new client selection criteria. Everyone in our firm will be responsible, in varying degrees and roles, for implementing the marketing and sales plan, the accomplishment of which will be a major corporate theme. When: I will start this process immediately by putting in place an implementation schedule built on our SMARTER goal setting methodology. Who: I will champion this process and will build an internal task force to drive it.